I had fig pudding at a restaurant once. It came to the table on fire in a grand display. It was spongy and dry and tasted like fruitcake. Which is probably the worst insult one can give to fig pudding. I was at the dinner with my classmates, and as I watched one after the other slightly push the plate away after one bite I was devastated. I was watching a tradition die. Fig pudding, according to history.com, started in Medieval England and became The Christmas Pudding of the English. But, it wasn’t a tradition that carried over to North America with the immigrants. Not many people in the U.S. eat fig pudding over the holidays. But my family does. Somewhere in the chaos of human migration my Scandinavian ancestors picked up this English tradition. My official passage into adulthood was marked by the acquisition of a copy of Great-Grandma Lillian’s original recipe where suet is still listed as an ingredient. (I’m told the current substitute is shortening). The task of preparing the pudding has not yet fallen on me, but when it does I am ready. 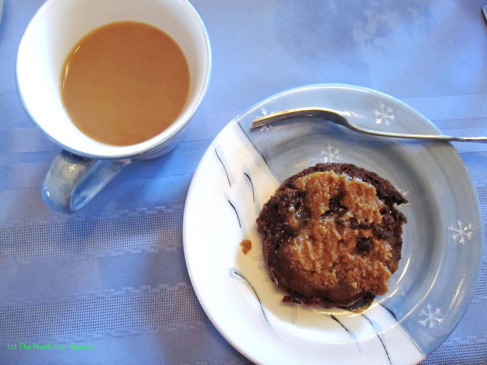 Fig pudding, in my childhood memories, is accompanied by aunts, uncles, and cousins all gathered at my Grandma Thissen’s house where the sounds of football and the smell of coffee permeate every room. Now that my siblings and I are adults, fig pudding is made by my mom and eaten a few hours after Christmas dinner when we’ve all made it home for the holidays. The fig pudding of my ancestors is not the flamboyant production that arrived at the restaurant that day. Real fig pudding is not made in a bunt pan. Instead, it is boiled in tin coffee cylinders in a big kettle of water with sticks at the bottom to keep it from burning and a brick placed on top to keep the cylinders from floating. It is cut in perfect circles and served on Mom’s special Christmas dishes carefully pulled out of boxes from the closet because there just isn’t enough cupboard space in the kitchen. Real fig pudding is dense and succulent with a simple brown sugar sauce on top for sweetness. Some like it warm but those who like it cold, like me, really know how to enjoy it. But the best part about fig pudding is that it’s the perfect companion for a cup of coffee and a gathering of family. The same way the generations before me and hopefully those after me will enjoy it. “Now bring us some figgy pudding,” indeed. What a lovely food and family tradition! I find it so interesting how certain foods can become associated with specific holidays. The family connection around food, especially special foods, can be the glue that holds a family together. It is a shame that some of these traditions are dying. People like you seem ready to carry the torch however, thank you. I found this to be very interesting. I have heard about figgy pudding from passing, or perhaps references in film. I didn’t know however, that it originated in Medieval England and became “the Christmas pudding of the English.” Many cultures have their traditions, many of which were lost during immigration to other countries or locations. I commend those who carry on their ancestral traditions. I think that this is a really nice tradition that you have with your family! It is something that really connects you with your ancestral heritage. I have never tried figgy pudding before, but it is nice to hear that you have fond memories surrounding it. I thought it was interesting how you mentioned that the immigrants did not bring over the tradition of eating figgy pudding from Medieval England, but I suppose a lot of traditions got lost through immigration and conforming to new customs. It is nice to see that this traditional food is still being enjoyed and celebrated! Like you, my family has a traditional holiday dessert, and the story is quite similar to yours. My family is from Slovenia and Serbia, and a traditional dessert there is called Poticia. Its a rolled dessert with a sweet dough and a walnut-honey mixture spread in-between the layers. Every December, my mom and dad stretch out the dough to a 6×3 sheet paper thin, spread the filling on the dough very thin, roll it into a “log”, and bake it. Its such a great tradition we have in my family, and what makes it so much more special is the that we only have it once a year. I love eating traditional foods that my great great grandparents made just as we do today. I think that this is very interesting. I loved the addition of including your great grandma’s recipe. It shows a great tradition you have to your past and I think it’s awesome that you plan on continuing making figgy pudding. Great job for continuing on the tradition! Thank you for sharing your family tradition! I am a little jealous that you have such a strong tradition that is still going. I love learning about things like this. I can only imagine your disappointment with the restaurants fig pudding, specially since it is something special to you. It makes me wonder if my past family members had a tradition like this one. I will have to look into it! Thank you for the idea and enjoy carrying on your tradition. What a lovely read! One of my favourite things to read about is traditions and how they are celebrated from person-to-person, family-to-family. I can’t say that I recall ever consuming fig pudding in my life, though it sounds delicious from your description and if given the chance to consume it, I shall! I particularly enjoyed your ending paragraph as you describe the process of how it is made. Thank you for sharing and best wishes in the future for when you carry on the tradition. I think that this article shows how important it is to preserve our culture and heritage in today’s society. Without traditions such as the making of fig pudding, we allow ourselves to forget about where we came from and how important our ancestry really is. Society needs to understand that now more than ever we need to be in touch with our roots because in doing so, we will allow our ansestors to live on through us. The last sentence of your first paragraph really caught my eye. Can we blame those around us for not embracing foods/ideas in general that are traditions to us and our families? I’ll admit, I would probably be too nervous and not brave enough to try the fig pudding, but that is probably caused by a lack of experience with it. It sounds like you’ve grown up enjoying it and that the pudding signifies a strong tradition with many memories, so it could be less about the food itself and instead about the memories that accompany its flavor. Do you see yourself passing it down to your children and nieces and nephews in the future, or not so much? This post was really interesting to read. Its always heartening to see traditions from the homeland passed down to the next generation. My family has a many Norwegian connection. My own family has a recipe box from our relatives that came on the mayflower! It is also a tradition that the parents in all our family teach the children to make lefse. Lefse is a traditional Norwegian dessert. “Making lefse seems straight forward, but it’s truly an art form. Many different and subtle twists to the basic potatoes, flour, butter and other lefse ingredients must be considered. Everyone adds their own little secret approach to making lefse.” (Lefsetime.com) This statement is true my family Christmas dinner table wouldn’t be complete without our own twist on lefse with cardamom and a dab of honey. I’ve never tried fig pudding before and didn’t realize it was a tradition for some. My family has our traditions, which may be different from the next person’s, so it is insightful to hear of other’s traditions. I think it’s great that your family passed down the recipe, I wish I had something like that! It’s great to see families continuing what their ancestors started. I truly enjoyed reading about this family tradition. It reminds us how these traditions passed on by our family connect us to where we originated from. Traditions like the fig pudding allows us to also bond with our family which is very precious time. Many of the traditions like this one are being lost because of everyone trying to keep up with the fast passed society. I find this upsetting that many people are losing touch with our families history. Sharing memories and stories over fig pudding or any other special dish is something our society and children need to stay grounded. My uncle has recently begun making fig pudding for our holidays and has brought it the last couple years. For him, it is a new tradition he is starting and carrying out alongside the traditions we’ve had for as long as I can remember. Holidays is always a time when family traditions become apparent and dinner wouldn’t be the same without fig pudding or whatever each family’s dish is. It’s always interesting to see how different cultures can pick up the traditions of another as well because my family is very Slovenian and we always have potica as well and an abundance of smoked meats, but we’ve also somehow inherited an English tradition. This is a great article and it ties in perfectly to the “Why We Eat Together” article as well. Many families have traditions that revolve around food, and it is nice to see that fig pudding is part of one of your traditions. 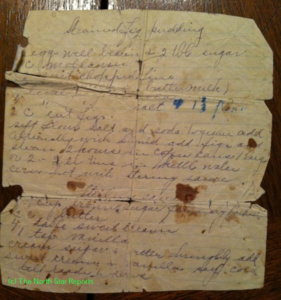 That is very nice that you have obtained a copy of the recipe from your Great-Grandma. The process to make fig pudding also sounds very interesting as well. This was a great article to read, and it ties in well to the “Why We Eat Together” article that we have discussed and read in class. It is always great to hear about what other peoples traditions are around the holiday time. That is very nice that your Great-Grandma has given you a copy of the recipe to carry out the tradition. The process of making the pudding sounds very interesting as well. To me, this article really shows how important specific traditions are to some people. It is cool to see someone who has such passion for their tradition and wants to keep the tradition alive. This article also shows how the large amount that traditions have evolved. Like the author said, real figgy pudding is dense and is not cooked in a bunt cake pan. Whereas now days, at restaurants, the figgy pudding has evolved and is usually baked in a bunt cake pan for simplicity. Some initial aspects of the tradition are still present, but it does show how traditions can evolve. It’s interesting reading how a food can be considered a tradition and connecting this to my past experiences. Coming from a very Norwegian family, we cook lefse every year at some time during the winter, so I could relate to this article. My family takes it upon ourselves to see that this tradition doesn’t die out. While others might not enjoy lefse, or even know what it is for that matter, it is a part of our family. The way that a certain tradition can bring families together is something very spectacular. Never have I tried this type of treat, but by the description given t seems to be rich and flavorful dessert. Not being able to relate to the taste of this dish I have my relations through the traditions of important dishes, especially with family. Passing down recipes such as this figgy pudding can create a long lasting love for the dessert. This article ties in to the “Why We Eat Together” article I previously read, where the simple things shared at the table can bring a family together in tradition and love. This was extremely interesting and fun to read. I grew up hearing the phrase “now give us some figgy pudding” but never actually knew what “figgy pudding” was until reading this. Now I want to give it a try (it’s good to know that some restaurants do not stay true to the traditional fig pudding, I want the real deal)! I also find it interesting that you described receiving your great grandmother’s recipe as a sort of rite of passage for you as the tradition was passed on. It sounds as though continuing the ritual of fig pudding is very important to you and your family! I enjoyed reading this article about how fig pudding is seen as a tradition to multiple cultures. I can attest to the lack of tradition being carried into the United States, however. I have heard of fig pudding and make the automatic connection to Christmas time but I have to admit that I have never tried it. It makes me think about my family’s traditions and how something can go almost unnoticed by others yet is highly valued by my family. I never had fig pudding before or ever seen fig pudding in my life. I am interested in what kind of ingredients go into the pudding. You mentioned how your ancestor’s recipe and the process of making pudding differs from the one you saw in the restaurant. I think this is interesting because there has been so many fusion to food when in comes to other cultural foods. An example is the typical Chinese food in the US is nowhere near the authentic taste you will find in China. Also, I think the first experience with cultural foods is important because it is the impression of it one will carry on. One may liked the taste of it or not. But in my opinion, restaurants may have possibly ruin the cultural tradition the food carries. The symbol of your friends pushing away the fig pudding seems to be a common trend of our generation. On one hand you can’t blame your friends for not being intrigued by the taste of fig pudding after being presented it in an overzealous way, but this food has played a major role in uniting your family and you have experience building relationships with your immediate family around the post Christmas dinner meal. The best part about this story is that it doesn’t matter if you’ve eaten fig pudding before (unless you take it completely literally) fig pudding stands as a symbol of any food or activity that you can imagine in your own mind that has connected your family and brought them closer together over the years, superseding your existence on this earth in most cases. The ability to produce something over this significance is necessary to build strong familial ties and help to grow each member of the family that participates in your chosen traditions. Really interesting article! I have never had fig pudding but nor have i ever even had the opportunity to try it. I agree with you that some traditions are slowly being lost with the modernization of the 21st century. I really liked how you associated that when you received the recipe for fig pudding it signified your adulthood. I also really enjoyed when you talked about the restaurants idea was no where close to your traditional idea of fig pudding. This shows what started out as a tradition for families has slowly been commercialized. Again great article! I have always found it interesting to learn about other people’s cultural backgrounds and what kind of impact it has on their current lives. These ancestral traditions are often all we have that connect us in some way to our ancestors of old. For me personally, I have a strong Swedish ancestry, yet the only thing that really connects me to this is my family’s tradition of occasionally making Swedish pancakes (a crepe rolled around a piece of bacon, toped with brown sugar, cinnamon and syrup). My dad says this was his grandfathers favourite dish and that is really the only connection I have to this part of my ancestry. As a sentimental person, I’m a sucker for traditions. This in particular sounds like a really interesting one, especially since your family is Scandanavian and ended up adopting one from the English. That’s a story I’d like to hear. And since that restaurant was obviously not up to par, I’m glad you guys have a recipe that sounds so excellent. I agree with Nancy that traditional foods are not necessarily foods for restaurants. That seems to miss the point of tradition somehow, the way it’s very particular to your family. Yet, someone may decide to make this terrible flaming fig pudding their tradition, so who’s to say? Traditions are an interesting topic indeed. This article was great because it shows how important traditions are. It’s cool to see how passionate someone can be about their own traditions from so long ago. I also agree that seeing traditions evolve into something they aren’t familiar to seeing and so commercialized can be so upsetting. On the other hand, I think it’s fascinating how food used to mainly be focused on a method for survival, but now we pay so close attention even to the smallest details it is prepared. After reading this, I want to try fig pudding now more than I ever have before. “Figgy pudding” is definitely my favorite Christmas treat when I’m home in England for winter break, so it was great to hear about your family traditions with the dessert! We serve it after Christmas dinner usually and when it comes to the table we pour Brandy over the pudding and then set it alight with a match. It’s great to learn how it is a family tradition for you and something which you hope to uphold. I find this article to be very interesting and also true. Holiday traditions seem to be losing popularity with our generation; which is cool because we are starting our own, but also sad because we are forgetting about these traditions that our relatives grew up with. My family has a tradition where my mom makes a cranberry cake that was her mother’s recipe. At first I was hesitant like most in my family but now I’m always the first to take the first slice! I agree that these traditions are best spent with family and a hot coffee but I hope, like many others, that we can keep these traditions alive and celebrate them for years to come. I like reading about family traditions that happen every year around the holidays. Personally, I am not a big figgy pudding eater, although i have tried it myself both at home and at the restaurant. Our family does have it’s own family tradition though. Every year on Christmas Eve, we gather at my Mother’s house for prime rib dinner and to open a few presents from our relatives on her side of the family. On Christmas Day, we head to my Dad’s side of the family. There, we munch on a buffet style pot luck, visit, and open a few gifts as well. It is one of the days i look forward to the most as all my cousins, aunts, and uncles are all together in one place. I think it’s wonderful that you enjoy such a unique traditional food! I find that I miss my grandma’s Finnish Christmas cake from my childhood (she always dowsed it in brandy but would make a cake that was aged without alcohol for the kids). Food is such a poignant way to connect with family and our pasts. I hope you are able to carry on and perhaps spread the love for fig pudding. I love this article because it shows how a simple dessert can create a strong connection within a family. Even though those other classmates did not have the appreciation for fig pudding like you have, doesn’t that make you want to hold onto that tradition even more, knowing that you have a piece of history that they don’t have? My family has our own tradition on Christmas Eve that I have never heard anyone else have. I feel lucky enough to be apart of a tradition that no one else does because it unites my family and our history even more. This reminds me of my own Christmas times when my family gathers together. Instead of pudding though my one aunt always brings taco chip dip. Like the pudding it’s not just food but really about the memories made and the time shared with family over the holidays. On figgy pudding itself I can’t say I’ve ever tried it, but now I’m curious! Personally I’ve never tried fig pudding or even seen it. Of course, I’ve heard of it because of Christmas songs but have never known anyone for whom it was a tradition. I appreciate the idea of food being a central part of traditions; it’s a very powerful thing. In my family we always have pickle wraps. As unrelated as they are to any holiday in particular, if we’re meeting as a family, we have them. I thought that this article was very interesting. I thought it was a very neat tradition to share with your relatives. I have never had fig pudding so this is complete news to me. I’m glad that your tradition was able to stick with your family all this time that is awesome! Many families share different types of traditions varying in many ways. I think this is important in bring a family closer together. It also gives you something to look forward to especially sound the holidays! What a cool tradition. This article makes me think about how so many traditions are dying throughout our world today. I wonder if it is because we are creating new ones, or believing we are ‘too modern’ to continue them. Some of the things my family does are things my great, great grandparents did across the globe, and I hope to continue them. Family traditions are so important when it comes to learning about family history, never give them up! I find it really interesting how everyone has such different traditions based around Thanksgiving. In my family we don’t have any special recipes, but instead spend our morning at the DECC helping set up for the free Thanksgiving buffet that they provide to the community. My parents started this tradition, over 10 years ago, when I was old enough to volunteer and we have done it ever since. I find it interesting that you grandmothers recipe has continued to be passed on throughout your family and that you still hang onto this tradition despite it not being as popular as it used to be. I appreciate learning about the history of fig pudding and what it means to your family. Thanks for sharing. I never knew that is how figgy pudding is made! Thanks for sharing that process. I love that the same recipe has been passed down in your family, and that it has become a family tradition for you! It is sad to see a tradition, especially one that is very important to your family, start to fade away.